Wish Upon a Star composed by Catherine Rollin. For Piano. Piano Solo; Solo. Early Intermediate level piece for the Piano Solo event with the National Federation of Music Clubs (NFMC) Festivals Bulletin 2008-2009-2010. SMP Level 3 (Early Intermediate); NFMC Level: Elementary Class 1. Sheet. 4 pages. 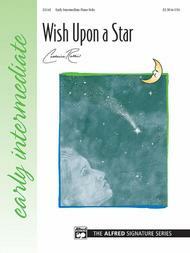 Published by Alfred Music (AP.22442).Who hasn't looked into the nighttime sky, seen that first star and made a wish? This charming solo brings to mind the wonder and beauty found in a starry sky. Rhythmic and melodic patterns abound throughout the piece. Analyzing each hand separately for these patterns would be an excellent first step when introducing this solo. The lyrical melody is wistful and balances nicely with the left hand. Students will be very successful in performing this piece with style and grace.About SMP Level 3 (Early Intermediate)Independent movement of the left hand. Multiple chords in a measure, and the introduction of triplets.